Credit John Baker, Flickr: EOL Images. Have you heard the buzz about bee colonies collapsing? Entomologist Noah Wilson-Rich wanted to study ways to keep bees healthy, but grant money proved elusive. For One Species at a Time, Ari Daniel ventures into a cloud of honey bees to learn about the unique way one bee scientist is managing to help bees and fund his research at the same time. 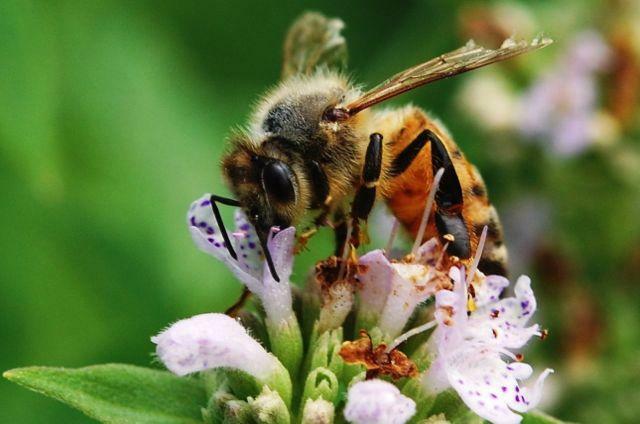 Learn more about Apis mellifera. The batman of Mexico has his own bat-cave. He just shares it with 4,000 Mexican long-nosed bats. In this episode, join researcher Rodrigo Medellin as he descends into the Devil’s Cave just north of Mexico City. It’s a journey that started decades ago when Medellin was on a game show as a boy. He lost the game show, but won a prize far more valuable—for himself, his students, and Mexico’s bats. Ari Daniel Shapiro reports from Tepoztlán. Find out more about Leptonycteris nivalis. Sometimes it’s hard to tell where one organism stops and another begins. That’s especially true with the kind of evolutionary arms race that takes place between parasites and their unwilling hosts. It’s biological warfare at the level of the genes. Ari Daniel reports from Athens, Georgia. Find out more about parasitic insects at the Encyclopedia of Life. If you were driving along a highway in Maine, past pine trees and summer cottages, you might not give a ditch of rust-colored water a second thought, unless you had the bad luck to drive into it. In this week’s podcast, Ari Daniel Shapiro meets some scientists who are wading into the rusty water and finding a whole ecosystem of unusual life forms.